Listed in CCBC's Best Books for Kids and Teens 2018 Fall Edition. Piper is the story of a boy learning to play the forbidden bagpipes as he travels on the immigrant ship, Hector across the stormy Atlantic ocean to Nova Scotia. "Johnny Piper's shoulders were shaking as he stood in front of the Captain. Dougal was trembling too, but he took a deep breath and stepped forward. "Please Sir," he said to the Captain "let him stay. We need a piper in New Scotland." According to Macky's brother, Macky is the worst newsboy ever but in the aftermath of the the terrible Halifax Harbour Explosion, Macky continues to deliver the newspapers that help people find their loved ones. He proves that even the worst newsboy ever can be an everyday hero. "Jumping over fallen telegraph wires and uprooted trees, Macky ran downhill after his friend. Half the city was gone, the rest flattened or on fire." Halsey is quite successful at turning a historical moment into a captivating story, one that will appeal the most to young school-aged children. The illustrations in Explosion Newsie are realistic and detailed. Migani excels at depicting facial expressions and action scenes; the reader can almost feel how cold it is outside! The illustrations complement the text well, and both work together to provide the reader with a realistic and compelling story. Highly Recommended. A school-age picture book, Illustrated by Eric Orchard. Nominated for the 2013 APMA Best Atlantic-Published Book award. Set on the famous schooner Bluenose, this is the story of ten year old Arty Brown and his friends who gut the cod aboard the fishing schooners out in the north Atlantic in the 1920s. Co-authored with Carrie Muller, and illustrated by Eric Orchard. Winner of the Mayor’s award for illustration CA (2009). book that topped local best seller lists for many weeks. 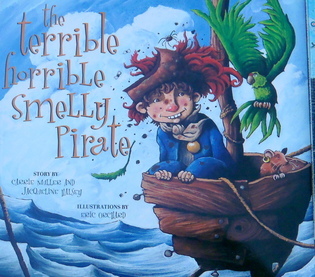 “Pirate’s don’t take bubble baths,” spluttered the terrible, horrible, smelly pirate. “But supposing there be treasure hidden under them bubbles,” squawked Parrot Polly. A Canadian Children's Book Center 2006 ‘Our Choice’ starred selection. 2007 Silver Birch Express Award. Peggy's Letters is now on Tumblebooks. living in London during the Second World War. 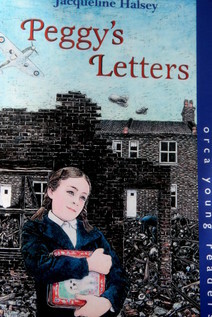 Through the eyes of eleven-year-old Peggy, the reader sees and feels what it was like to experience air raids, food rationing, loss and unlikely friendships in a war-torn city. Placed third in the 2003 Atlantic Writing Competition - Joyce Barkhouse award for Children's Literature. Subsequently, published by Scholastic Education in their “Literacy Place for the Early Years” series. Josh and his siblings, in an attempt to cheer up their Gran, take Dad’s idea of yard work a step further by creating a water garden in Gran’s back yard. Of course everybody, including Dad, gets covered in mud, which cheers Gran up no end.